This design is intended as a D&T project for groups at secondary schools, or after school clubs. It exploits the CNC milling machines that many schools have. Using Lego gears and a cheap cordless screwdriver, you can make a sideways walking crab and by combining rotary motion gearing and cams you can get a near perfect stepping action. The mechanism for the walking action is copied from the film advance mechanism of cinematic projectors: Pegs on pairs of large gears run in a hole and a carefully profiled slot in each leg to get the smooth walking action. sprockets and gears from a motor/gearbox and re-chargeable battery pack from a cheap cordless screwdriver mounted on the top of the body. 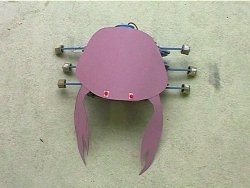 (The crab design is in fact two back-to-back ‘Thing’ walking hands- see Technogames 2002 page). The students will need to experiment with foot design and foot materials to get appropriate grip on their chosen walking surface. 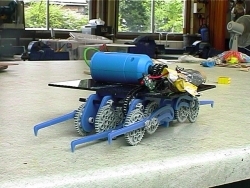 Additional challenges for older students might include vacuum forming a shell and claws, improving the walking action by working out a different slot profile, or working out a way to steer it.